17 July 1913 launched as the SMS DERFFLINGER. Displacement: Normal: 26,600 t Full Load: 31,200 ton, Dim. 210.40m x 29m x 9.20m (draught). Propulsion: Four Parsons turbines 75,585 shp (56,364 kW); 18 boiler; four shafts, speed 26.5 knots. Range by a speed of 12 knots, 5,600 mile. Armament: 8 × 30.5 cm (12.0 in) SK L/50 in 4 twin turrets, 12 × 15 cm (5.9 in) SK L/45 in 12 single casemate mounts, 4 × 8.8 cm (3.5 in) SK L/45 (4×1) in 4 single casemate mounts, 4 × single 50 cm (20 in) torpedo tubes. Crew 44 officers and 1,068 men. 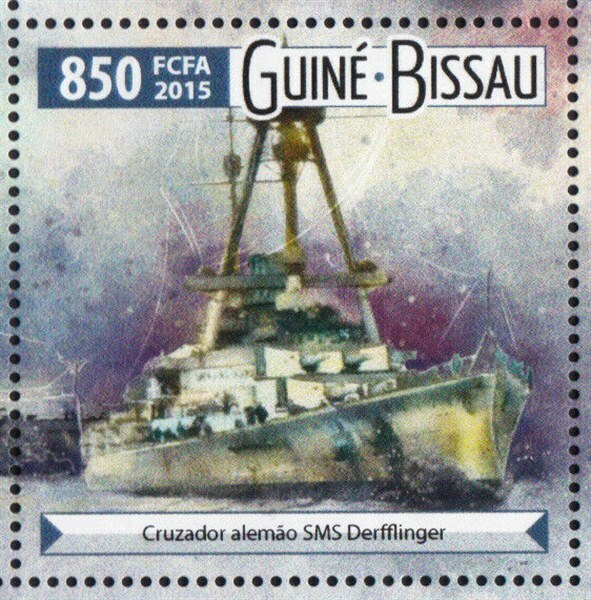 SMS DERFFLINGER was a battlecruiser of the German Kaiserliche Marine built just before the outbreak of World War I. She was the lead vessel of her class of three ships; her sister ships were LÜTZOW and HINDENBURG. The DERFFLINGER-class battlecruisers were larger and featured significant improvements over the previous German battlecruisers, in terms of armament, armor protection, and cruising range. The ship was named after Field Marshal Georg von Derfflinger who fought in the Thirty Years' War. DERFFLINGER was part of the I Scouting Group for most of World War I, and was involved in several fleet actions during the war. She took part in the bombardments of English coastal towns, as well as the Battles of Dogger Bank and Jutland, where her stubborn resistance led to the British nicknaming her "Iron Dog". The ship was partially responsible for the sinking of two British battlecruisers at Jutland; DERFFLINGER and SEYDLITZ destroyed QUEEN MARY, and LÜTZOW assisted her elder sister in the sinking of INVINCIBLE. DERFFLINGER was interned with the rest of the High Seas fleet at Scapa Flow following the armistice in November 1918. Under the orders of Rear Admiral Ludwig von Reuter, the interned ships were scuttled on 21 June 1919; DERFFLINGER sank at 14:45. Built by Blohm & Voss at their yard in Hamburg, DERFFLINGER's keel was laid in January 1912. She was to have been launched on 14 June 1913, but the wooden sledges upon which the ship rested became jammed; the ship moved only 30–40 centimeters. A second attempt was successful on 12 July 1913. A crew composed of dockyard workers took the ship around the Skagen to Kiel. In late October, the vessel was assigned to the I Scouting Group, but damage to the ship's turbines during trials prevented her from joining the unit until 16 November. On completion she displaced 26,600 t (26,200 long tons) and was 210.40 m (690 ft 3 in) long. The ship had a crew of 44 officers and 1,068 enlisted men. DERFFLINGER was equipped with two sets of high- and low-pressure turbines powered by 14 coal-burning boilers that drove four propellers. She was capable of a top speed of 26.5 knots (49.1 km/h; 30.5 mph), and could steam for 5,600 nautical miles (10,400 km; 6,400 mi) at a cruising speed of 14 knots (26 km/h; 16 mph). In early August 1915, a derrick was mounted amidships, and tests with Hansa-Brandenburg W seaplanes were conducted. Mounting a main armament of eight 30.5 cm (12 in) guns, DERFFLINGER was the largest and most powerful German battlecruiser at the time. The ship's armament was rounded out by twelve 15 cm (5.9 in) SK L/45 guns in single casemate mounts and eight 8.8 cm (3.5 in) SK L/45 guns, also placed in casemates, though four of these were removed in 1916. An additional four 8.8 cm flak guns were installed amidships. Four 50 cm (20 in) submerged torpedo tubes were carried; one was located in the bow, two on the broadside, and one in the stern. DERFFLINGER's first combat operation was a raid on the English coastal towns of Scarborough, Hartlepool, and Whitby. One raid had already been conducted by the battlecruisers of the I Scouting Group, on the town of Yarmouth in late 1914. Admiral Friedrich von Ingenohl, the commander of the High Seas Fleet, decided to conduct another raid on the English coast. His goal was to lure a portion of the Grand Fleet into combat where it could be isolated and destroyed. At 03:20 on 15 December, Rear Admiral Franz von Hipper, with his flag in SEYDLITZ, departed the Jade estuary. Following SEYDLITZ were DERFFLINGER, MOLTKE, VON DER TANN, and BLÜCHER, along with the light cruisers KOLBERG, STRASSBURG, STRALSUND, and GRAUDENZ, and two squadrons of torpedo boats. The ships sailed north past the island of Heligoland, until they reached the Horns Reef lighthouse, at which point the ships turned west towards Scarborough. Twelve hours after Hipper left the Jade, the High Seas Fleet departed to provide distant cover. The main fleet consisted of 14 dreadnoughts, eight pre-dreadnoughts and a screening force of two armored cruisers, seven light cruisers, and 54 torpedo boats. Some four months earlier, on 26 August 1914, the German light cruiser MAGDEBURG had run aground in the Gulf of Finland; the wreck was captured by the Russian navy, which found code books used by the German navy, along with navigational charts for the North Sea. The Russians passed these documents to the Royal Navy, whose cryptographic unit—the so-called Room 40—began decrypting German signals. On 14 December, they intercepted messages relating to the planned bombardment of Scarborough. However, the exact details of the plan were unknown, and the British assumed that the High Seas Fleet would remain safely in port, as in the previous bombardment. Vice Admiral David Beatty's four battlecruisers, supported by the 3rd Cruiser Squadron and the 1st Light Cruiser Squadron, along with the 2nd Battle Squadron's six dreadnoughts, were to ambush Hipper's battlecruisers. During the night of 15 December, the main body of the High Seas Fleet encountered British destroyers. Fearing the prospect of a night-time torpedo attack, Admiral Ingenohl ordered the ships to retreat. Hipper was unaware of Ingenohl's reversal, and so he continued with the bombardment. Upon reaching the British coast, Hipper's battlecruisers split into two groups. DERFFLINGER and VON DER TANN went south to shell Scarborough and Whitby while SEYDLITZ, MOLTKE, and BLÜCHER went north to shell Hartlepool. By 09:45 on the 16th, the two groups had reassembled, and they began to retreat eastward. By this time, Beatty's battlecruisers were positioned to block Hipper's chosen withdrawal route, while other forces were inroute to complete the encirclement. At 12:25, the light cruisers of the II Scouting Group began to pass through the British forces searching for Hipper. One of the cruisers in the 2nd Light Cruiser Squadron spotted STRALSUND and signaled a report to Beatty. At 12:30, Beatty turned his battlecruisers towards the German ships. Beatty presumed that the German cruisers were the advance screen for Hipper's ships; however, those were some 50 km (31 mi) ahead. The 2nd Light Cruiser Squadron, which had been screening for Beatty's ships, detached to pursue the German cruisers, but a misinterpreted signal from the British battlecruisers sent them back to their screening positions. This confusion allowed the German light cruisers to slip away and alerted Hipper to the location of the British battlecruisers. The German battlecruisers wheeled to the northeast of the British forces and escaped. Both the British and the Germans were disappointed that they failed to effectively engage their opponents. Admiral Ingenohl's reputation suffered greatly as a result of his timidity. MOLTKE's captain was furious; he stated that Ingenohl had turned back "because he was afraid of 11 British destroyers which could have been eliminated...under the present leadership we will accomplish nothing." The official German history criticized Ingenohl for failing to use his light forces to determine the size of the British fleet, stating: "he decided on a measure which not only seriously jeopardized his advance forces off the English coast but also deprived the German Fleet of a signal and certain victory." 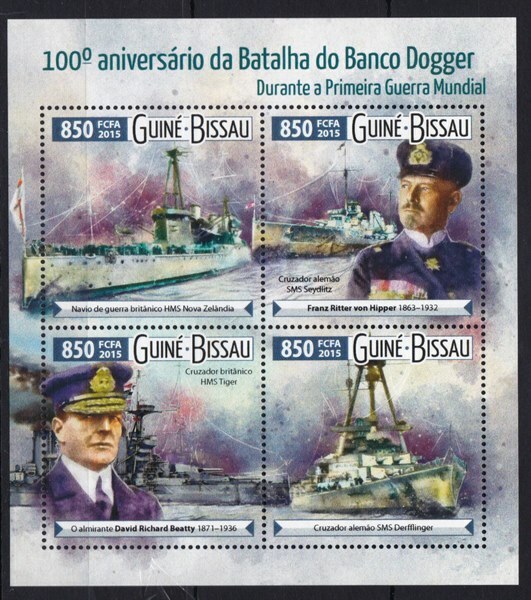 In early January 1915, the German naval command became aware that British ships were reconnoitering in the Dogger Bank area. Admiral Ingenohl was initially reluctant to attempt to destroy these forces, because the I Scouting Group was temporarily weakened while VON DER TANN was in drydock for periodic maintenance. Konteradmiral Richard Eckermann, the Chief of Staff of the High Seas Fleet, insisted on the operation, and so Ingenohl relented and ordered Hipper to take his battlecruisers to the Dogger Bank. On 23 January, Hipper sortied, with SEYDLITZ in the lead, followed by MOLTKE, DERFFLINGER, and BLÜCHER, along with the light cruisers GRAUDENZ, ROSTOCK, STRALSUND, and KOLBERG and 19 torpedo boats from V Flotilla and II and XVIII Half-Flotillas. GRAUDENZ and STRALSUND were assigned to the forward screen, while KOLBERG and ROSTOCK were assigned to the starboard and port, respectively. Each light cruiser had a half-flotilla of torpedo boats attached. Again, interception and decryption of German wireless signals played an important role. Although they were unaware of the exact plans, the cryptographers of Room 40 deduced that Hipper would be conducting an operation in the Dogger Bank area. To counter it, Beatty's 1st Battlecruiser Squadron, Rear Admiral Archibald Moore's 2nd Battlecruiser Squadron and Commodore William Goodenough's 2nd Light Cruiser Squadron were to rendezvous with Commodore Reginald Tyrwhitt's Harwich Force at 08:00 on 24 January, approximately 30 mi (48 km) north of the Dogger Bank. At 08:14, KOLBERG spotted the light cruiser AURORA and several destroyers from the Harwich Force. AURORA challenged KOLBERG with a search light, at which point KOLBERG attacked AURORA and scored two hits. AURORA returned fire and scored two hits on KOLBERG in retaliation. Hipper immediately turned his battlecruisers towards the gunfire, when, almost simultaneously, STRALSUND spotted a large amount of smoke to the northwest of her position. This was identified as a number of large British warships steaming towards Hipper's ships. Hipper turned south to flee, but was limited to 23 knots (43 km/h; 26 mph), which was the maximum speed of the older armored cruiser BLÜCHER. The pursuing British battlecruisers were steaming at 27 knots (50 km/h; 31 mph), and quickly caught up to the German ships. At 09:52, the battlecruiser LION opened fire on BLÜCHER from a range of approximately 20,000 yards (18,300 m); shortly thereafter, QUEEN MARY and TIGER began firing as well. At 10:09, the British guns made their first hit on BLÜCHER. Two minutes later, the German ships began returning fire, primarily concentrating on LION, from a range of 18,000 yards (15,460 m). At 10:28, LION was struck on the waterline, which tore a hole in the side of the ship and flooded a coal bunker. At 10:30, NEW ZEALAND, the fourth ship in Beatty's line, came within range of BLÜCHER and opened fire. By 10:35, the range had closed to 17,500 yards (16,000 m), at which point the entire German line was within the effective range of the British ships. Beatty ordered his battlecruisers to engage their German counterparts. Confusion aboard TIGER led the captain to believe he was to fire on SEYDLITZ, which left MOLTKE able to fire without distraction. During this period of the battle, DERFFLINGER was hit once, but the shell did only minor damage. Two armor plates in the hull were forced inward and some of the protective coal bunkers were flooded. At 10:40, one of LION's 13.5 in (34 cm) shells struck SEYDLITZ causing nearly catastrophic damage that knocked out both of the rear turrets and killed 159 men. The executive officer ordered the flooding of both magazines to avoid a flash fire that would have destroyed the ship. By this time, the German battlecruisers had zeroed in on LION, scoring repeated hits. At 11:01, an 11 in (28 cm) shell from SEYDLITZ struck LION and knocked out two of her dynamos. At 11:18, two of DERFFLINGER's 12 in (30 cm) shells hit LION, one of which struck the waterline and penetrated the belt, allowing seawater to enter the port feed tank. LION had to turn off its engines due to seawater contamination and as a result fell out of the line. By this time, BLÜCHER was severely damaged after having been pounded by heavy shells. The chase ended when there were several reports of U-boats ahead of the British ships; Beatty quickly ordered evasive maneuvers, which allowed the German ships to increase the distance to their pursuers. At this time, LION's last operational dynamo failed, which dropped her speed to 15 knots (28 km/h). Beatty, in the stricken LION, ordered the remaining battlecruisers to "Engage the enemy's rear," but signal confusion caused the ships to solely target BLÜCHER, allowing MOLTKE, SEYDLITZ, and DERFFLINGER to escape. BLÜCHER was hit by over 70 shells from the British battlecruisers over the course of the battle. The severely damaged warship capsized and sank at approximately 13:10. By the time Beatty regained control over his ships, after having boarded PRINCESS ROYAL, the German ships had too great a lead for the British to catch them; at 13:50, he broke off the chase. DERFFLINGER also took part in the bombardment of Yarmouth and Lowestoft on 24–25 April 1916. Hipper was away on sick leave, so the German ships were under the command of Konteradmiral Friedrich Boedicker. DERFFLINGER, her newly commissioned sister ship LÜTZOW, and the veterans MOLTKE, SEYDLITZ and VON DER TANN left the Jade Estuary at 10:55 on 24 April. They were supported by a screening force of 6 light cruisers and two torpedo boat flotillas. The heavy units of the High Seas Fleet, under the command of Admiral Reinhard Scheer, sailed at 13:40, with the objective to provide distant support for Boedicker's ships. The British Admiralty was made aware of the German sortie through the interception of German wireless signals, and deployed the Grand Fleet at 15:50. By 14:00, Boedicker's ships had reached a position off Norderney, at which point he turned his ships northward to avoid the Dutch observers on the island of Terschelling. At 15:38, SEYDLITZ struck a naval mine, which tore a 50-foot (15 m) hole in her hull, just abaft of the starboard broadside torpedo tube, allowing 1,400 short tons (1,250 long tons) of water to enter the ship. SEYDLITZ turned back, with the screen of light cruisers, at a speed of 15 knots (28 km/h; 17 mph). The four remaining battlecruisers turned south immediately in the direction of Norderney to avoid further mine damage. By 16:00, SEYDLITZ was clear of imminent danger, so the ship stopped to allow Boedicker to disembark. The torpedo boat V28 brought Boedicker to LÜTZOW. At 04:50 on 25 April, the German battlecruisers were approaching Lowestoft when the light cruisers ROSTOCK and Elbing, which had been covering the southern flank, spotted the light cruisers and destroyers of Commodore Tyrwhitt's Harwich Force. Boedicker refused to be distracted by the British ships, and instead trained his ships' guns on Lowestoft. At a range of approximately 14,000 yd (13,000 m), the German battlecruisers destroyed two 6 in (15 cm) shore batteries and inflicted other damage to the town, including the destruction of some 200 houses. At 05:20, the German raiders turned north, towards Yarmouth, which they reached by 05:42. The visibility was so poor that the German ships fired one salvo each, with the exception of DERFFLINGER, which fired fourteen rounds from her main battery. The German ships turned back south, and at 05:47 encountered for the second time the Harwich Force, which had by then been engaged by the six light cruisers of the screening force. Boedicker's ships opened fire from a range of 13,000 yards (12,000 m). Tyrwhitt immediately turned his ships around and fled south, but not before the cruiser CONQUEST sustained severe damage. Due to reports of British submarines and torpedo attacks, Boedicker broke off the chase and turned back east towards the High Seas Fleet. At this point, Scheer, who had been warned of the Grand Fleet's sortie from Scapa Flow, turned back towards Germany. Almost immediately after the Lowestoft raid, Admiral Reinhard Scheer began planning another foray into the North Sea. He had initially intended to launch the operation in mid-May, but the mine damage to SEYDLITZ had proved difficult to repair, and Scheer was unwilling to embark on a major raid without his battlecruiser forces at full strength. At noon on 28 May, the repairs to SEYDLITZ were finally completed, and the ship returned to the I Scouting Group. DERFFLINGER and the rest of Hipper's I Scouting Group battlecruisers lay anchored in the outer Jade roadstead on the night of 30 May 1916. The following morning, at 02:00 CET, the ships steamed out towards the Skagerrak at a speed of 16 knots (30 km/h; 18 mph). DERFFLINGER was the second ship in the line of five, ahead of SEYDLITZ, and to the rear of LÜTZOW, the group flagship. The II Scouting Group, consisting of the light cruisers FRANKFURT, Rear Admiral Boedicker's flagship, WIESBADEN, PILLAU, and ELBING, and 30 torpedo boats of the II, VI, and IX Flotillas, accompanied Hipper's battlecruisers. An hour and a half later, the High Seas Fleet under the command of Admiral Scheer left the Jade; the force was composed of 16 dreadnoughts. The High Seas Fleet was accompanied by the IV Scouting Group, composed of the light cruisers STETTIN, MÜNCHEN, HAMBURG, FRAUENLOB, and STUTTGART, and 31 torpedo boats of the I, III, V, and VII Flotillas, led by the light cruiser ROSTOCK. The six pre-dreadnoughts of the II Battle Squadron had departed from the Elbe roads at 02:45, and rendezvoused with the battle fleet at 05:00. Shortly before 16:00, Hipper's force encountered the six ships of Vice Admiral Beatty's 1st and 2nd battlecruiser squadrons. The German ships were the first to open fire, at a range of approximately 15,000 yards (14,000 m). When the British ships began returning fire, confusion amongst the British battlecruisers resulted in MOLTKE being engaged by both NEW ZEALAND and TIGER. The British rangefinders had misread the range to their German targets, and so the first salvos fired by the British ships fell a mile past the German battlecruisers. Due to errors in British communication, DERFFLINGER was unengaged during the first 10 minutes of the battle. DERFFLINGER's gunnery officer, Korvettenkapitän Georg von Hase later remarked "By some mistake we were being left out. I laughed grimly and now I began to engage our enemy with complete calm, as at gun practice, and with continually increasing accuracy." At 17:03, the British battlecruiser HMS INDEFATIGABLE exploded after 15 minutes of gunfire from VON DER TANN. Shortly thereafter the second half of Beatty's force, the four Queen Elizabeth-class battleships of the 5th Battle Squadron, came into range and began firing at VON DER TANN and MOLTKE. Following severe damage inflicted by LÜTZOW on LION, DERFFLINGER lost sight of the British ship, and so at 17:16 transferred her fire to HMS QUEEN MARY. SEYDLITZ was also engaging QUEEN MARY, and under the combined fire of the two battlecruisers, QUEEN MARY was hit repeatedly in quick succession. Observers on NEW ZEALAND and TIGER, the ships behind and ahead, respectively, reported three shells from a salvo of four struck the ship at the same time. Two more hits followed, and a gigantic explosion erupted amidships; a billowing cloud of black smoke poured from the burning ship, which had broken in two. The leading ships of the German High Seas fleet had by 18:00 come within effective range of the British battlecruisers and Queen Elizabeth-class battleships and had begun trading shots with them. Between 18:09 and 18:19, DERFFLINGER was hit by a 38 cm (15 in) shell from either Barham or Valiant. At 18:55, DERFFLINGER was hit again; this shell struck the bow and tore a hole that allowed some 300 tons of water to enter the ship. Shortly after 19:00, the German cruiser WIESBADEN had become disabled by a shell from the battlecruiser INVINCIBLE; the German battlecruisers made a 16-point turn to the northeast and made for the crippled cruiser at high speed. At 19:15, they spotted the British armored cruiser DEFENCE, which had joined the attack on WIESBADEN. Hipper initially hesitated, believing the ship was the German cruiser ROSTOCK, but at 19:16, Kapitän zur See Harder, LÜTZOW's commanding officer, ordered his ships' guns to fire. The other German battlecruisers and battleships joined in the melee; DEFENCE was struck by several heavy-caliber shells from the German ships. One salvo penetrated the ship's ammunition magazines and a massive explosion destroyed the cruiser. By 19:24, the 3rd Battlecruiser Squadron had formed up with Beatty's remaining battlecruisers ahead of the German line. The leading British ships spotted LÜTZOW and DERFFLINGER and began firing on them. In the span of eight minutes, the battlecruiser INVINCIBLE scored eight hits on LÜTZOW. In return, both LÜTZOW and DERFFLINGER concentrated their fire on their antagonist, and at 19:31, DERFFLINGER fired her final salvo at INVINCIBLE. Shortly thereafter the forward magazine detonated and the ship disappeared in a series of massive explosions. By 19:30, the High Seas Fleet, which was by that point pursuing the British battlecruisers, had not yet encountered the Grand Fleet. Scheer had been considering retiring his forces before darkness exposed his ships to torpedo boat attack. He had not yet made a decision when his leading battleships encountered the main body of the Grand Fleet. This development made it impossible for Scheer to retreat, for doing so would have sacrificed the slower pre-dreadnought battleships of the II Battle Squadron. If he chose to use his dreadnoughts and battlecruisers to cover their retreat, he would have subjected his strongest ships to overwhelming British fire. Instead, Scheer ordered his ships to turn 16 points to starboard, which would bring the pre-dreadnoughts to the relative safety of the disengaged side of the German battle line. 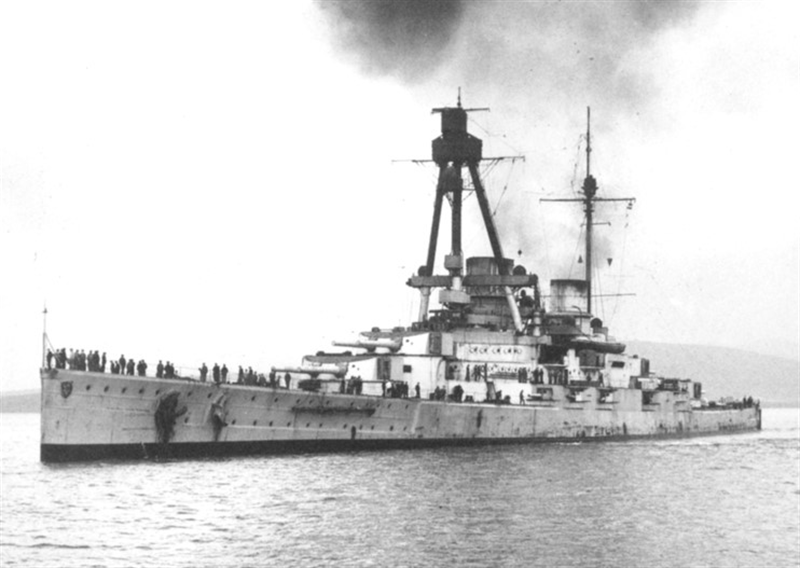 DERFFLINGER and the other battlecruisers followed the move, which put them astern of KÖNIG. Hipper's badly battered ships gained a temporary moment of respite, and uncertainty over the exact location and course of Scheer's ships led Admiral Jellicoe to turn his ships eastward, towards what he thought was the likely path of the German retreat. The German fleet was instead sailing west, but Scheer ordered a second 16-point turn, which reversed course and pointed his ships at the center of the British fleet. The German fleet came under intense fire from the British line, and Scheer sent DERFFLINGER, SEYDLITZ, MOLTKE, and VON DER TANN at high speed towards the British fleet, in an attempt to disrupt their formation and gain time for his main force to retreat. By 20:17, the German battlecruisers had closed to within 7,700 yards (7,000 m) of COLOSSUS, at which point Scheer directed the ships to engage the lead ship of the British line. Three minutes later, the German battlecruisers turned in retreat, covered by a torpedo boat attack. A pause in the battle at dusk (approximately from 20:20 to 21:10) allowed DERFFLINGER and the other German battlecruisers to cut away wreckage that interfered with the main guns, extinguish fires, repair the fire control and signal equipment, and prepare the searchlights for nighttime action. During this period, the German fleet reorganized into a well-ordered formation in reverse order, when the German light forces encountered the British screen shortly after 21:00. The renewed gunfire gained Beatty's attention, so he turned his battlecruisers westward. At 21:09, he sighted the German battlecruisers, and drew to within 8,500 yards (7,800 m) before opening fire at 21:20. In the ensuing melee, DERFFLINGER was hit several times; at 21:34, a heavy shell struck her last operational gun turret and put it out of action. The German ships returned fire with every gun available, and at 21:32 hit both LION and PRINCESS ROYAL in the darkness. The maneuvering of the German battlecruisers forced the leading I Battle Squadron to turn westward to avoid collision. This brought the pre-dreadnoughts of the II Battle Squadron directly between the two lines of battlecruisers. In doing so, this prevented the British ships from pursuing their German counterparts when they turned southward. The British battlecruisers opened fire on the old battleships; the German ships turned southwest to bring all of their guns to bear against the British ships. This engagement lasted only a few minutes before Admiral Mauve turned his ships 8-points to starboard; the British inexplicably did not pursue. Close to the end of the battle, at 03:55, Hipper transmitted a report to Admiral Scheer informing him of the tremendous damage his ships had suffered. By that time, DERFFLINGER and VON DER TANN had only two operational guns each, MOLTKE was flooded with 1,000 tons of water, LÜTZOW had sunk, and SEYDLITZ was severely damaged. Hipper reported: "I Scouting Group was therefore no longer of any value for a serious engagement, and was consequently directed to return to harbor by the Commander-in-Chief, while he himself determined to await developments off Horns Reef with the battlefleet." During the course of the battle, DERFFLINGER was hit 17 times by heavy caliber shells and nine times by secondary guns. She was in dock for repairs until 15 October. DERFFLINGER fired 385 shells from her main battery, another 235 rounds from her secondary guns, and one torpedo. Her crew suffered 157 men killed and another 26 men wounded; this was the highest casualty rate on any ship not sunk during the battle. Because of her stalwart resistance at Jutland, the British nicknamed her "Iron Dog." During the Second Battle of Heligoland Bight in November 1917, DERFFLINGER sailed from port to assist the German light cruisers of the II Scouting Group, but by the time she and the other battlecruisers arrived on the scene, the British raiders had fled northward. In late 1917, the High Seas Fleet began to conduct anti-convoy raids in the North Sea between Britain and Norway. In October and December, German cruisers and destroyers intercepted and destroyed two British convoys to Norway. This prompted Beatty, now the Commander in Chief of the Grand Fleet, to detach several battleships and battlecruisers to protect convoys in the North Sea. This presented to Admiral Scheer the opportunity for which he had been waiting the entire war: the chance to isolate and eliminate a portion of the Grand Fleet. At 05:00 on 23 April 1918, the High Seas Fleet left harbor with the intention of intercepting one of the heavily escorted convoys. Wireless radio traffic was kept to a minimum to prevent the British from learning of the operation. By 14:10, the convoy had still not yet been located, and so Scheer turned the High Seas Fleet back towards German waters. DERFFLINGER was to have taken part in what would have amounted to the "death ride" of the High Seas Fleet shortly before the end of World War I. The bulk of the High Seas Fleet was to have sortied from its base in Wilhelmshaven to engage the British Grand Fleet; Scheer—by now the Großadmiral of the fleet—intended to inflict as much damage as possible on the British navy, in order to retain a better bargaining position for Germany, whatever the cost to the fleet. While the fleet was consolidating in Wilhelmshaven, war-weary sailors began deserting en masse. As DERFFLINGER and VON DER TANN passed through the locks that separated Wilhelmshaven's inner harbor and roadstead, some 300 men from both ships climbed over the side and disappeared ashore. On 24 October 1918, the order was given to sail from Wilhelmshaven. Starting on the night of 29 October, sailors mutinied on several battleships; three ships from the III Squadron refused to weigh anchors, and the battleships THÜRINGEN and HELGOLAND reported acts of sabotage. The order to sail was rescinded in the face of this open revolt. The following month, the German Revolution toppled the monarchy and was quickly followed by the Armistice that ended the war. Following Germany's capitulation, the Allies demanded that the majority of the High Seas Fleet be interned in the British naval base at Scapa Flow. On 21 November 1918, under the command of Rear Admiral Ludwig von Reuter, the ships sailed from their base in Germany for the last time. The fleet rendezvoused with the light cruiser CARDIFF, before meeting a massive flotilla of some 370 British, American, and French warships for the voyage to Scapa Flow. Once the ships were interned, their breech blocks were removed, which disabled their guns. The fleet remained in captivity during the negotiations that ultimately produced the Versailles Treaty. It became apparent to Reuter that the British intended to seize the German ships on 21 June, which was the deadline by which Germany was to have signed the peace treaty. Unaware that the deadline had been extended to 23 June, Reuter ordered his ships be sunk. On the morning of 21 June, the British fleet left Scapa Flow to conduct training maneuvers. With the majority of the British fleet away, Reuter transmitted the order to his ships at 11:20. DERFFLINGER sank at 14:45. The ship was raised in 1939 and was anchored, still capsized, off the island of Risa until 1946. DERFFLINGER was then sent to Faslane Port and broken up by 1948. The ship's bell was delivered to the German Federal Navy on 30 August 1965.